These men were experts at throwing their voices. The churrero, whose cart held a pot of boiling fat, a simple machine that extruded star shaped dough and a big metal shaker of sugar to shake on the cooked product, would station himself by the corner curb of downtown streets and his churrero would roll with the “r” through the nearby streets. Softer and more musical was the call of pirulí—a crystallized sweet packaged in those familiar little paper spills. That word, pronounced in Spanish, didn’t need music. It had its own. Years later the manicero model of entrepreneurship and productivity would acquire the elegant term of “microenterprise” in some jargon and “informal economy activity” in the language of others. Each parqueador had his own territory, which he defended with the fierce human animal instinct for survival. Any encroachment brought on a loud argument and a shoving match at propina time. This put the client in the Solomon seat and he had to single out the one he knew. If he knew neither, then it would be the smallest and the one who was probably having the hardest time. Of such things are informal regulatory systems made. Development has always been surrounded by a panoply of changing buzz words. And in the last two decades of the 20th century none sounded louder than “informal sector” and “micro.” It was as though a new form of penicillin had been developed which was guaranteed to do away with poverty. In fact, the prescription was far from new. The birth of financial cooperatives which addressed the needs of the urban and rural “underserved” of Germany had blazed this trail as early as the mid-1800s. And the presence of an active informal sector in Cuba in the 1940s and 1950s is clearly evidenced in the colorful descriptions of John Parker. Yet it is frequently convenient to overlook certain facts when marketing old wine in new bottles. Nevertheless the fact that exaggeration may have prevailed at one point should not prevent us from recognizing that attention to the informal sector can be an important element in efforts to energize developing economies. We would indeed argue that in Cuba this sector could play an increasingly important role in the economic development of the country. Growth of the informal sector is coming—but when and how are much more difficult questions to answer. The intent of this essay is to identify some of the major questions that arise when one thinks about the changes which would need to be considered in Cuba in order to strengthen the informal sector of the economy. We do so by: (1) describing some of the major relevant characteristics of the Cuban environment; (2) exploring various so-called micro methods used to provide financial services to the informal sector in other countries; (3) reviewing the major lessons learned in applying these methods; and (4) identifying some of the major changes which would need to take place in Cuba if this sector is to be given a better chance to develop. IS THERE AN INFORMAL PRODUCTIVE SECTOR IN CUBA TODAY? Superficial observation of daily life in Cuba today might suggest that little remains of earlier productive models which prevailed in that country. But they are there, if you know where to look. Case in point, in 2003 a Canadian Anglican church group looking for a ladder to help with a painting project at a local church could only find these at the dollar stores, and at extremely high prices.2 Upon leaving one of these locations, a Cuban accompanying them suggested a stop while he went over and talked to an older gentleman standing by a column with a five foot wooden ladder next to him. After a few minutes the Cuban returned indicating that this gentleman would not only sell the ladder but make several more for them at a very reasonable price—in dollars. He did not have a permit to produce these so they would need to pick them up several days later at the apartment building where he lived. The transaction had taken place within eyesight of a policeman who most likely knew exactly what was going on and might even have received a small consideration from the carpenter, thus adding to numerous examples cited by others of the highly developed skills in the art of “hay que resolver” which have arisen in Cuba. This same group noted yet another example of informal sector entrepreneurship at a market in Havana when seeking to purchase food for the preparation of their meals. Though able to purchase some of the items which they needed, they could not find potatoes at any of the stands in the market. Concluding that potatoes were not to be had that day, the group was surprised to find that on the steps leading out of the market sat an old man who softly chanted, “Papas, papas, vendo papas.” He was not allowed to sell in the market but quietly had his own monopoly on the steps of the market. Marketing specialists have a great deal to learn on the streets of Havana. Micro activities are also to be found in the vast informal market within which Cubans barter their services and gain access to materials. In other times and places this would have been referred to as “black market” activities. In the Cuba of today, they are simply survival strategies accepted as a fact of life and part of the art of “hay que resolver,” viewed as legitimate in times of duress. The word credit may not be spoken nor is there an exchange of cash or other monetary instruments in these bartering exchanges. But many needs are being met today through cashless exchange. It is like a lesson has been taken from earlier stages of economic history and evolution before monetization came about. There can be no doubt that micro activities are present in Cuba. But little is being done to stimulate the sector. Much to the contrary, the steps that are taken are geared to discourage its development. In Cuba, the only legal source of inputs is the state. Most small and micro entrepreneurs, including collectivized and small private farmers, find it difficult to access that source, including those who have a legal license to operate. Even in the case of people making simple food for street sale, Cuban informal producers must find input supplies in the black market, where many of the supplies are stolen from state enterprises and warehouses. And in the rural sector, artificially generated pricing of agricultural products leads to continued efforts by producers to sell products on the open market rather than through the largely mandatory state procurement system. In a society where strict centralized controls are in place within a strong ideological framework, and where most prices are administratively determined, profitability or even business survival may depend on the possibility of operating in the informal or black market, both illegal in Cuba. Under such conditions it is not surprising that record keeping in the informal sector is virtually non-existent and existing levels of personal documentation would hardly meet most credit evaluation requirements. Informal commerce activities in Cuba are not invisible. The Cuban government is quite aware of their existence and scope. It has chosen to tolerate them in recognition of the possibility of rebellion and of their own incapability to provide the services and commodities needed or sought by the population. Even Raúl Castro has recognized this fact on several occasions since he became the government leader in 2007. In fact, in the last two years, a number of police operations against informal commerce have been put into effect, only to fizzle out when the government has gauged that the public’s reaction was becoming too volatile. As in the case of inputs, formal productive credit in Cuba is totally controlled by the government. There are no institutions other than those of government that are allowed to provide credit or any other type of financial service to rural or urban sector producers. In the rural sector, financial services are presumably delivered through the Credit and Services Cooperatives (CSC), the Unidades Básicas de Producción Cooperativa (UBPC), and ACOPIO, the state official procurement agency. The members of CSCs are small rural producers who still farm their own land. Their cooperatives, however, are not independent financial institutions but simply convenient pass-through mechanisms used by the state to support those areas of production of interest to it. The same can be said of the units of UBPC which serve farmers who are working state-owned lands through so-called cooperatives that bear little resemblance to true cooperatives. In the opinion of Raúl Castro and most farm producers, the system has never worked well or in a timely fashion. Production credit for state-controlled farms, which cover 73% of the arable land, is processed through ACOPIO. Funding for the fixed price purchase of agricultural products from these farms comes from the national budget. In the urban sector, most micro productive or service activities are illegal and owners, legal or not, have no formal access to financial services. We have found no statistical evidence whatsoever of credit flows to this informal sector in Cuba. But there is an increasingly significant informal source of credit reaching some microentrepreneurs. Remittances constitute a major source of productive capital that finances some legal and many informal productive activities, including artisan restaurants (the paladares), ironwork shops, shoe-making shops, and car repair shops. Most of these are quite visible and their operation outside the limits of the law is apparent to all. Informal reports would suggest that remittance-based capitalization frequently has a high “return on investment” rate. But “small is beautiful” has a different meaning in Cuba. Individual success is definitely not encouraged. And growth is simply not allowed. It is telling that Cubans are not permitted to organize small and medium size enterprises. Thus, a successful legal micro entrepreneur, a cuentapropista, cannot get to develop into a larger firm because of this legal impediment. A Cuban Bill Gates would still be forced to continue tinkering with computers in his small garage after successfully developing his famed software. Ironically, foreign investors, including Cuban Americans, can seek and get legal permission to develop and register small and medium enterprises (SMEs), as long as they can get the legally mandated Cuban government partnership participation. Much can be learned from recent formulations to address the low-income productive credit challenges of today. A number of different financial service approaches have become familiar throughout the poorer economies of the world. These approaches seek to introduce significant new programs, which will help people become more productive, assist to improve standards of living and broaden the reach of national economies. Their focus has been on population groups not served by formal financial systems, which in Cuba is the vast majority of people at all income levels. Five major types of institutional arrangements have begun to expand the provision of financial services to those previously not served throughout the world. These types are: community associations; solidarity banks; village banks; financial cooperatives (credit unions); and the commercial banking sector. We will briefly review their main characteristics. Community associations take different forms but all aim at gathering member resources to satisfy the needs of the members of the group. They all encourage and depend on small savings amounts of members. One of the oldest is the rotating savings and credit association (or ROSCA), where members, usually 12, commit to contribute a fixed level of resources every month, for a year. The sum of total monthly “payments” goes to a different member every month. The sequence is determined by lottery. In a variation of this model, members bid on monthly payouts to accelerate receipt of the money pot, the bid corresponding to the quickness with which the money is gotten. This is akin to paying a price for time saved in getting the pot, i.e., an interest rate. As with other approaches reviewed below, ROSCAs require confidence and trust among the group members. Everyone in the compact will continue their monthly contributions, even though some may have already enjoyed receiving the monthly pot. Trust in the person or institution that organizes the group and collects the money must also exist. Trust is essential. Yet, this factor is buttressed by and, in fact, depends on the written or unwritten moral principles of the community. In many communities these are akin to a legal framework. Solidarity banks (SBs), pioneered by ACCION Internacional, a U.S. non-governmental organization, depend on the type of principle of mutual solidarity prescribed by the community social contract. These groups typically consist of groups of 25 to 40 individuals, usually organized by an outside activist. Members receive small loans for productive activities or for family traditional obligations, such as care for the sick, weddings, and funerals. Payback time is short so most activities thus financed must have a quick turn around. Funding has relied on foreign aid sources, as only in later phases have these SBs been able to mobilize members’ savings, but only as they have transformed into fully regulated commercial banks. Within each group, smaller sub-groups accept the responsibility to pay back a member’s loan should the borrower not be able to pay it back when due. This is a serious commitment for poor people as it is for anyone. The sub-group usually participates in assessing the request for funds from each member so that, when approved, the loan has had their tacit agreement. The group meets periodically to discuss loan requests and to learn about financial planning. Solidarity banks such as Bancosol in Bolivia or MiBanco in Perú, have grown into large, powerful commercial banks, still serving poor clients, among others. In fact, they have justified the broadening of functions as the means to access more resources to carry out their original objective. 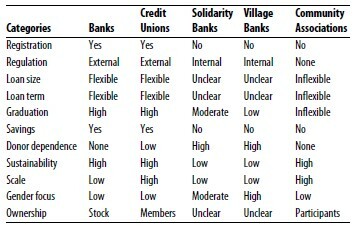 Village banks (VBs) are very similar to solidarity banks. The approach has been used by Grameen, initially in Bangladesh, and by FINCA, initially in Latin America. An outside promoter organizes these banks with funds received from donors or the local government. Each unit serves about 25 to 40 members and provides only relatively small loans on a short-term basis. Village banks are usually not allowed to mobilize members’ savings, although some have developed techniques to do so under a different set of rules. This proscription has to do with the lack of outside regulation that would protect members’ savings. Both Grameen and FINCA have moved very aggressively toward a set of internal regulations that would insure probity in the conduct of business by the managers. However, they are still outside the supervisory control of government financial regulators, including the central bank. Thus, their ability to mobilize savings is not strong. Grameen has developed a number of commercial ventures, many involving member-produced goods, which have allowed the organization to raise funds for operations. They have also accessed the capital markets to finance these activities. Financial cooperatives (credit unions) are, in reality, a more complex approach than the former approaches to financial services. Whereas the other models reviewed above have focused almost exclusively on offering credit, financial coops offer a wider range of services. In many ways, they resemble commercial banks. Two major differences are that members own the coop and the coop is a non-profit institution. Thus, the objective is not to realize a profit but to serve the needs of member-owners. While many may feel that these differences are merely rhetorical, coop managers are not only expected to address those needs but also to make sure all costs are covered. The need to realize operational surpluses obeys the need to insure capital adequacy and to expand the scope and size of credit programs. Financial coops are individually independent but usually band under provincial or national associations. In many programs funded by foreign donors, a major goal has been explicitly to seek modern management approaches and self-regulation. Thus, accounting systems are designed to offer maximum transparency and financial safety. International guidelines on capital requirements and debt ratios are usually followed. The focus on mobilizing savings to attain sustainability many times requires some form of outside regulation, ideally by the state financial regulator or, with their acquiescence, by the financial cooperative association. Credit unions and banks have two very important characteristics in common that distinguishes them from community associations, village banks and solidarity banks. First and foremost, they have a clearer defined ownership structure—defined by membership in the first case and by stock holdings in the other. The other approaches that we have identified have run into significant challenges due to an absence of a clear definition of ownership. The second common characteristic is related to sustainability. Financial cooperatives and banks, to be sustainable and successful, depend on savings mobilization as the main source of their core and operational capital. These characteristics give them a large degree of independence from external sources of funds, which may not be either available when needed or very expensive. Commercial banks traditionally have not been keen in serving poor, small entrepreneurs. Banks are not as familiar with that population group as communitybased organizations. Thus, it is more difficult and costly for them to assess creditworthiness or capacity to pay. Banks have tended to see lower income groups as high risks and working with them as undermining profit maximization. Yet, experience shows that the poor may have, historically, a better payback record than more accommodated entrepreneurs. Experience also shows that poor people save. Many have been surprised by the findings in some micro programs that their members/clients value savings services as highly as they value loans. The savings of these participants though small are essential for individuals to counterweight the higher risks they face that things may go wrong with their productive activities. They simply have very little fallback room. The need and desire for saving services is strong. To date, only financial coops and banks offer this service on a regular basis. During the last decade, many banks have begun programs to serve the underserved. They are beginning to view the informal sector as a promising target. Some, including some financial coops, have teamed up with local NGOs, which are closer to the client. This increases the feasibility and lowers the costs of assessing the risk profile of poor clients. In the U.S., for example, City Bank and Illinois Shore Bank have implemented very successful programs. But in Cuba, there are no commercial banks as the state is the only source of credit or saving services. With the exception of community associations, which have been part of the traditional informal structure of many countries, most of the models which we have reviewed were started with funds provided from outside, usually foreign aid donors. Some have begun to move toward self-sustainability by mobilizing clients’ savings and/or by accessing capital markets on a commercial basis. Most of these institutional arrangements have not been subject to state financial regulation. Starting with the financial cooperatives, many of them, if not all, have been moving rapidly to some form of regulation, either by the state, the local associations, or by the international NGO organizing the effort. Over the years, it has become difficult to evaluate the various methodologies previously described. In fact, at one time it was impossible to be heard unless swearing allegiance to the sanctity of poverty-lending focused almost entirely on lending to women in the poorest of the poor category. The effectiveness of the funding provided for activities focused on such lending was not to be questioned. Nevertheless, with the possible exception of the Grameen Bank program in Bangladesh, the effective outreach of such programs was and is limited and almost appears to be inversely correlated with the sums invested. Moreover, even in the case of the Grameen Bank, it has been difficult to get a complete assessment of what the true investment in this program has been over time. Trust is at the heart of any successful financial services program. Loan requirements should not include collateral guarantees, but repayment of loans will be significantly improved if backed by solidarity groups or cooperative member co-signers, i.e., social collateral. Initial loans should be limited in size and increased over time as repayment histories are built up. Initial loans should be limited to short terms of payment. Initial loans should be strictly limited to income generating investments capable of generating income increases to service the loan. Overall, women are better loan risks than men. Overall, the poor are better loan risks than the rich. Interest rates charged on loans should cover all costs associated with the provision of such credit. A just legal framework that allows fair disposition of disputes. Legal status and respect for private property and contracts. Climate that supports and stimulates private small and medium size enterprise. Freedom for the entrepreneur to decide his/her line of business, where to conduct it, and where to sell the production or service. A market-based price mechanism that provides adequate guidelines for effective investment and product selection. Input markets that facilitate access to inputs at market set prices. Macro policies that maintain monetary stability and confidence in national currency. Overall transparency and probity as a rule for government and business practices. Trustworthy authorities that deliver what they promise under the law. Registration—whether organization is legally recognized. Regulation—whether the activities of the organization are regulated. Loan size—whether there is a limit on the size of loans. Loan term—whether there is a short limit on the term of a loan. Graduation—whether credit programs allow for growing with client. Savings—whether organization is legally allowed to receive savings. Donor dependence—degree to which programs are dependent on external donor sources. Sustainability—whether programs are capable of sustaining themselves without subsidies. Scale—degree of outreach of programs. Gender focus—whether programs are focused primarily on women. Ownership—whether ownership of organization is clearly documented and understood. Table 1 shows how each of the five institutional arrangements or strategies described above would be classified within each of the eleven categories described. Careful review of the characteristics of each strategy can be most useful in determining which strategy would be best suited to a particular set of national circumstances. We leave it to the readers to draw their own conclusions as to which strategy or strategies might be best suited to conditions in Cuba. The challenges that will be faced in bringing about needed changes to stimulate the growth of the informal sector of the economy in Cuba are many. It is clear that present conditions in Cuba are not highly favorable to the strengthening and growth of the informal sector of the economy. Without doubt the largest challenge to the development of the informal sector is attitudinal. The initial challenge is that of bringing about change in the attitudes of those in power in Cuba in respect to sustaining citizen economic dependence upon the government. The secondary challenge in this category is changing the long-engrained patterns of survival behavior on the part of most of the population. Ignoring and bending rules has become a value in itself. And what would seem to be corrupt or illegal to us is very likely viewed not only as inevitable and acceptable but to be emulated. Years of experience in development work have demonstrated that the concept of an obligation to repay loans is a very relative thing. And this is particularly so when the source of credit is associated with an external or a governmental program. It has been fifty years since anyone in Cuba has had any real experience with financial services and loans. And the habits established over this period of time will be difficult to overcome. Clearly, promotion of the informal sector will require changes in the Cuban legal environment. And these changes will need to be substantial given that at present the laws of Cuba constrain rather than promote growth of the informal sector. Attitudinal changes of those in power toward economic independence will be a pre-requisite to any such actions. Many elements of the Cuban legal framework have not been conducive to the growth of business and commercial activities. Entrepreneurs and borrowers need to have a legal right to operate; they need to have a means of seeking enforcement of contracts and property rights. They need market determined prices that guide them concerning what to produce or which services are in demand, in order to succeed. They need a currency that is trustworthy and stable as a means of measuring and rewarding productive activity. These factors, among others, are not the norm in Cuba, and must change for micro finance to have its impact. Our sense is that, unless there is very significant change in the legal framework, not to mention the official ideological attitude toward entrepreneurship and private property, no approach mentioned in this section would be feasible, unless it is fully dependent on external transfers that may never be paid back. Corruption and very possibly capture of these transfers by local party cadres looms as a threat to an efficient demand- driven microfinance system. It is instructive to note that few of the approaches used in the recent past to promote the micro side have been programs run by national governments. The importance of the role of non-governmental institutions in this development strategy is most apparent. Moreover, promoting the establishment of such entities in the Cuban context will be one of the greatest challenges to be faced by any reform-oriented government. However, how to convince an authoritarian regime that it is in its best interest to move in this direction will be difficult. Is there an optimal institutional approach for Cuba? Or could one think of a mixture of different approaches that will complement each other in addressing needs at the local level? It really depends on what the government is willing to do to change the structure of the economy. For example, recent decisions to adjust salaries upward to better reflect productivity levels or as stimulus to increase production could create some saving capacity. However, available data on consumption suggests that gaps are so large that these increases will disappear into delayed consumption because of lack of adequate income for so long. Our sense is that, unless there is very significant change in the legal framework, not to mention the official ideological attitude toward entrepreneurship and private property, no approach mentioned here would be feasible, unless it is fully dependent on external transfers that may never be paid back. Corruption and very possibly capture of these transfers by local party cadres looms as a threat to an efficient demand-driven microfinance system. 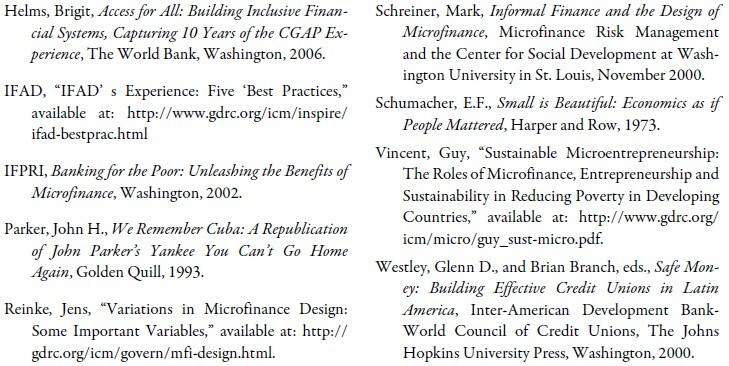 A second consideration is important to assess the feasibility of organizing a microfinance system in Cuba. We emphasized before that an essential element of all of the non-bank financial institutions was trust at the level of the community. Even if there is external regulation and supervision, discussed later on, the essence of working together in a village bank like institution or in a cooperative is being able to trust your fellow members and those who manage the group. The last 50 years in Cuba have fostered a climate of profound distrust in the population. One simply cannot trust anyone for fear of draconian punishment by the security apparatus if one’s intentions or beliefs are perceived as contrary to the interests of the group in power. Changing these attitudes will take a long time, even if the current regime were to collapse. The accession to power of Raúl Castro heralded an apparent willingness to recognize large errors, and promises of changes and reforms. Yet little of this has come to fruition. Even the land usufruct proposal, currently under way, is plagued by the same type of excessive micromanaging controls that has led to the collapse of agriculture on the island. Village bank type institutions, which depend and buttress individuals’ solidarity with each other, might help foster confidence within the member group, but only if they are closely supervised so that members’ trust is not betrayed by corruption or political malfeasance. Financial cooperatives could also buttress trust and confidence and might have a wider impact on entrepreneurship because of its larger financial prowess. Nevertheless, they must be subject to external regulation and supervision, not very different in kind and depth than commercial banks. Commercial banks can play a role in building a trust in financial services but only if they are convinced of the profitability of providing non-collateralized loans to micro entrepreneurs. Developing a commercial banking sector in a future Cuba will have to rely, initially, on attracting branches of foreign bank that have the capital to undertake what could be a high return business. But these institutions will not have much interest in providing financial services to very small entrepreneurs, unless induced to do so. Few of the requisite parts are in place in Cuba. This very serious lack suggests how difficult it will be to develop sustainable microfinance institutions, even with the financial help of foreign donors. That said one could start the process after short-term changes are made to permit individuals and groups the right to organize associations and formal groups, commercial or social, not under the direct control of the state. Moreover, there would be a need to extend the role of market pricing to all products and allow decision-making freedom to all producers, something that even China and Vietnam have done successfully. It has not helped that the regime is afraid that a population that is financially autonomous of the state will eventually start to question their lack of participation in the political decision-making process (say free contested elections). This fear has led to immobility in making many of the structural economic reforms promised. Movement toward an environment that will promote strengthening and growth within the informal sector will also require elimination of a large number of legal impediments and prohibitions present in the Cuban system which curtail not only economic growth but also the security and property rights of individuals. Changes and reforms designed to attain a situation in which all of these elements exist will take time, transparency and consistency in the implementation of a restructuring policy. It is doubtful that all can be achieved concurrently. We believe, however, that, in the medium term, all of these elements are important conditions to successful microfinance systems and a dynamic economy. A key perspective is to decide the sequence in which reforms will be undertaken without creating confusion and chaos. Some reforms will beget changes in other elements that will actually strengthen the reform process. For instance, adopting market pricing over administered prices and allowing producers to decide on product mix will improve investment efficiency and production levels without any other changes. Nevertheless, initial changes in some of these areas might be sufficient to start developing a financial system for the underserved. In particular, entrepreneurs, of all sizes, need to have freedom to make their own investment decisions and choice of work. In addition, a legal system that insures respect for contractual commitments and private property will make development of financial institutions easier. Moreover, even with these significant changes, there would be a need, early on, for a regulatory framework to insure efficiency and probity in the micro finance system, regardless of the mix of institutions that may operate in it. We have the example of the current crisis in our own financial system, mostly due to shortfalls in the U.S. regulatory system. There have also been many cases of mismanagement and/or illegal behavior in unregulated micro finance institutions in developing countries. These irregularities have caused damage to the resources and confidence of poor people. Thus, the need for strong and clear rules is essential. In fact, continuous monitoring by an external supervisory institution is the only assurance against mismanagement. This supervision and monitoring, applied to all forms of microfinance, would be a practice similar to that practiced in most developed and a large number of developing economies. Although it is very difficult to rank the importance of all of the issues that we identify in this paper, there can be no question that the willingness or unwillingness of the Cuban government to relinquish their total control of credit activities will be central to the future expansion of the informal sector. We are unlikely to see this change in the very near future. What would motivate the Cuban government to create an environment that would reward independence of citizens rather than total dependence of these upon government? Fostering change in the informal sector, which would make it less dependent upon the government, is bound to undermine a totalitarian [populist authoritarian] regime. The best answer to this question may be that circumstances will provide the motivation. The serious food and economic crisis that continues to affect Cuba must be reversed before chaos and widespread hunger ensues. The regime knows that only by permitting a high degree of economic freedom can the situation begin to change. There lays the question posited before. What kind of financial system, designed to serve the small and micro entrepreneur, can be developed that will not feel like a threat to the political power of the current leadership? Alternatively, at least, that feels like a manageable threat. Experience worldwide suggests that any participatory financial system to serve the underserved will not foster, in the short to medium term, an effective civil society ready to defend and protect its rights as a group. This may happen in time if the group remains cohesive, organized, and aware of its rights and of when they are being trampled or ignored. Thus, developing a system of independent microfinance institutions is not likely to create short-term political instability. Rather, by helping to increase economic well being, it may make people happier with their life and less politically restless. It is clear that present conditions in Cuba are not highly favorable to the strengthening and growth of the informal sector of that economy. Briefly stated, there are attitudinal, legal and institutional factors which are adverse to such development. Without doubt the largest challenge to the development of the informal sector is attitudinal. The initial challenge is that of bringing about change in the attitudes of those in power in Cuba in respect to economic independence. The secondary challenge in this category is changing long engrained patterns of survival behavior. Clearly, promotion of the informal sector will require changes in the Cuban legal environment. And these changes will need to be substantial given that at present the laws of Cuba constrain, rather than promote, growth of the informal sector. Attitudinal changes of those in power toward economic independence will be a pre-requisite to any such actions. Once attitudes and laws have changed it will make sense to try to assess what new forms of institutional capability will need to be developed in Cuba to give support to the manicero economy. And these changes will be substantial given the virtual absence of any such capabilities. The challenges to the informal sector are multiple and difficult. Yet it would be a mistake to think that this sector will be dormant until the changes are made. The evidence in the daily activities of many Cubans is ready evidence that the informal sector is, and will continue to be, very active. Past experience indicates that growth in the informal sector is closely associated with the demonstration effect which the examples of others can have in economies with high levels of underemployment. For those seeking to improve the bare survival living conditions of their families, there is nothing like seeing that their neighbors have found a way of improving their lot in life. The demands for conditions that will help them to succeed as well become hard to ignore. The key to any strategy to strengthen the Cuban informal sector will be that of selecting activities which set a cascade effect in motion. It will not require addressing how each individual challenge is to be met but rather how to trigger a process which makes it essential that these challenges be met. Will it be difficult to develop a microfinance system to assist in the development of micro, small and medium size enterprise in Cuba? Yes! Can one expect, realistically, that attitudes will change, both on the side of government concerning total controls, and on the side of common people with respect to small corruption and product deviations? It will take time and recognition that these changes are critically necessary to the survival of Cuba as a nation. However, it will happen. If the new leader of the regime, who has recognized the severe problems Cuba’s economic and social structure faces, becomes aware that drastic change does not necessarily lead to chaos or loss of power, he may be more open to reforms of the type he promised. Widespread small corruption is the offspring of poverty and necessity. What father or mother would not recur to stealing or to illegal markets when their child has no access to milk or to sources of protein? Once the economic system is on the mend, producing employment and income, once people are able to make their own decisions on what they want to do with their lives, whether to work on their own or seek decently remunerated employment, product diversions and the black market will have no reason to exist and will disappear as a major problem. Building a microfinance system need not be a colossal task. The attractiveness of the different models we have reviewed is that one can start small, and grow as resources—human and financial—permit. Many foreign NGOs and development assistance donors are engaged in helping countries develop such systems. Both urban and rural small entrepreneurs, including small farmers can be reached. What is required is a decision to start and the freedom to operate, under supervision, and according to the laws of the market. 1. Parker, John H., We Remember Cuba: A Republication of John Parker’s Yankee You Can’t Go Home Again, Golden Quill, 1993. 2. One of the authors of this essay (Chris Baker) was a participant in this project.